I have not written much about climate of late because my interest, err, runs hot and cold. As most readers know, I am in the lukewarmer camp, meaning that I accept that Co2 is a greenhouse gas but believe that catastrophic warming forecasts are greatly exaggerated (in large part by scientifically unsupportable assumptions of strong net positive feedback in the climate system). If what I just said is in any way news to you, read this and this for background. Anyway, one thing I have been saying for about 8 years is that when the history of the environmental movement is written, the global warming obsession will be considered a great folly. This is because global warming has sucked all the air out of almost anything else in the environmental movement. For God sakes, the other day the Obama Administration OK'd the wind industry killing more protected birds in a month than the oil industry has killed in its entire history. Every day the rain forest in the Amazon is cleared away a bit further to make room for ethanol-making crops. You might reasonably say, well that pollution is from the burning of fossil fuels, and the global warming folks want to reduce fossil fuel use, so aren't they trying to fight this? And the answer is yes, tangentially. But here is the problem: It is an order of magnitude or more cheaper to eliminate polluting byproducts of fossil fuel combustion than it is to eliminate fossil fuel combustion altogether. What do I mean? China gets a lot of pressure to reduce its carbon emissions, since it is the largest emitter in the world. So it might build a wind project, or some solar, or some expensive high speed rail to reduce fossil fuel use. Let's say any one of these actions reduces smog and sulfur dioxide and particulate pollution (as seen in this photo) by X through reduction in fossil fuel use. Now, let's take whatever money we spent in, say, a wind project to get X improvement and instead invest it in emissions control technologies that the US has used for decades (coal plant scrubbers, gasoline blending changes, etc) -- invest in making fossil fuel use cleaner, not in eliminating it altogether. This same money invested in this way would get 10X, maybe even up to 100X improvement in these emissions. By pressuring China on carbon, we have unwittingly helped enable their pollution problem. We are trying to get them to do 21st century things that the US can't even figure out how to do economically when in actuality what they really need to be doing is 1970's things that would be relatively easy to do and would have a much bigger impact on their citizen's well-being. Environmentalists are simply anti-business statists willing to use whatever junk-science they can lay hands on to justify their positions. That's true now, however, it wasn't always like that. One of the founders of Greenpeace quite the organization in protest of its take over by the watermelons. cities, so it was a serious enough problem when one day people woke up and a windless winter day was densely foggy from coal and they left on the streetlamps in the day. They banned soft coal use a little bit after that. The STL city hall is still stained black on the exterior from a century-plus of sustained coal use. one of the most important concepts of economics and management is marginal cost vs marginal benefit. The first dollar of cost may provide $10 of benefit, the second dollar may provide $6 of benefit, the third dollar may provide $3 of benefit and the fourth dollar may provide $1 of benefit. By now you have spend $4 to provide $20 of benefit, yet the 5th dollar will provide additional benefit though the total will show $20 of benefit and $5 cost. The environmentalists fail to acknowledge that there is any concept of cost benefit much less marginal cost v marginal benefit. As a result, significant amounts of money is wasted. Another example is voc reduction to reduce ground level ozone. Reductions of both are lofty goals, yet attempts to reduce VOC have resulted in greater overall pollution, not less. Along with the virtually zero marginal increase in benefit by the any marginal reduction in ground level ozone. Again the key measurement is the marginal increase in benefit vs the marginal increase in cost. What problem? 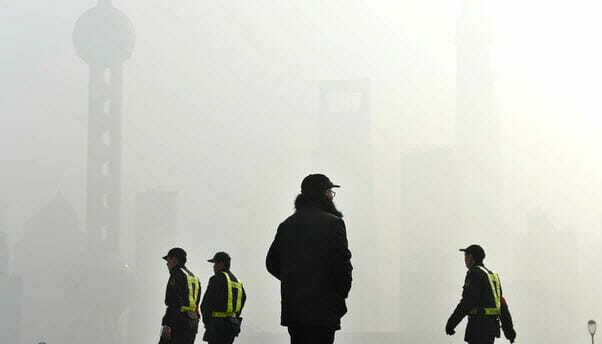 The smog is a sign of genuine technological process that helps to lift up the poorest people in China. Anti-environmentalists like to gloat that there's no alternative to coal and oil so this situation is the optimal one. While I don't know China's main reason for going head over heals on greenfield building of HSR lines, I suspect the real reason is they simply need more freight capacity. The mixing of passenger trains with freight trains gets tricky since they both operate very differently. Of course they could've done the same w/out HSR. Maybe HSR instead of new traditional speed passenger lines was driven other things. Much of the pollution you see in Beijing is actually dust which is blown in from the Gobi desert. The ongoing construction keeps it suspended, which is why you see trucks watering the roads. In early spring the leaves are green and slowly turn grey from the dust. Although actual pollution exists, a good part of what we actually observe is natural. The worst pollution I've ever seen was in Chongqing after the wheat harvest, where all the stalks are burned in the fields.